We got to San Pedro the Atacama around noon, starving and pretty salty. Therefore, the first day was mainly consumed by activities such as looking for food, washing our clothes and processing the many impressions of the recent days. The next morning however, we were ready again for more. Thus we rented bikes and road off to explore the Atacama desert. Our first destination was a place called “Quebrada del Diablo”. This is a canyon, where hardly any tourists seem to go (or at least on that day). Thus, we were the only ones making our way through it. Amazed by the stunning scenery, we somehow managed to loose our originally planned track, due to which we got an extra workout session by having to carry our bikes down a steep path back to San Pedro de Atacama. 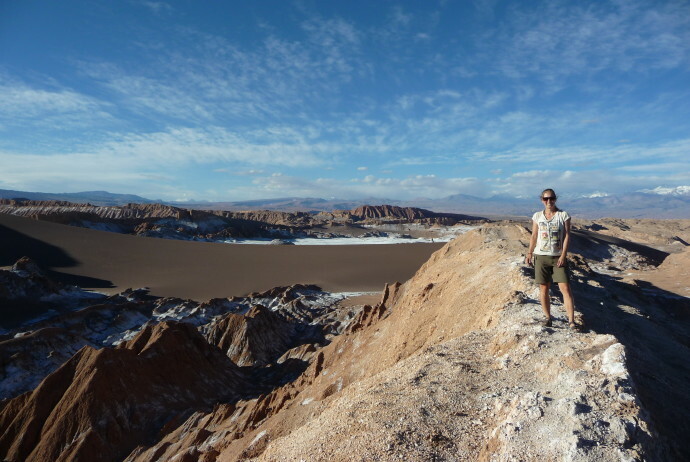 In the afternoon of the same day we had recovered enough for another bike ride, this time to the “Valle de la Luna” (the “valley of the moon”). There we climbed through salt caves and hiked up sand dunes, to get an overview of this out-of-space-like landscape. We were super lucky, as just recently it had rained in the area for the first time in 80 years or so (according to the lady at the park entrance). Due to that, the whole place was covered by white salt evaporations that looked a lot like snow to our Tyrolean perception. We got back in the evening, quite exhausted but happy and packed our stuff for the next bus ride back to Argentina. We had decided to go to Salta and the nearby towns of Tilcara and Humahuaca as it was a great opportunity to explore some bits of Argentina’s North while working our way back to Bolivia. We did not regret our choice as the scenery was amazing and we had time to do some great hikes which took us up to peaks of over 4200 m above sealevel. We are now writing this on our bus ride to the Bolivian border where we probably have to say goodbye to Argentina for good – at least for this trip, but who knows!? Where to sleep: Hostel La Ruca – small and cozy with a great breakfast included. Where to eat & drink: Try the local empanadas. We found them to be the best so far and you can get them on every corner in San Pedro de Atacama. What to see & do: Rent a bike and ride around the area, there is loads and loads to see!